Principle #7 – Agency. Learners are not passive recipients of learning, but active agents with the ability to choose how they will apply their attention and effort, and to choose what learning activities they will engage in. Others may exercise their agency to promote or inhibit the agency of the learner, and may play a role in facilitating or impeding successful learning. 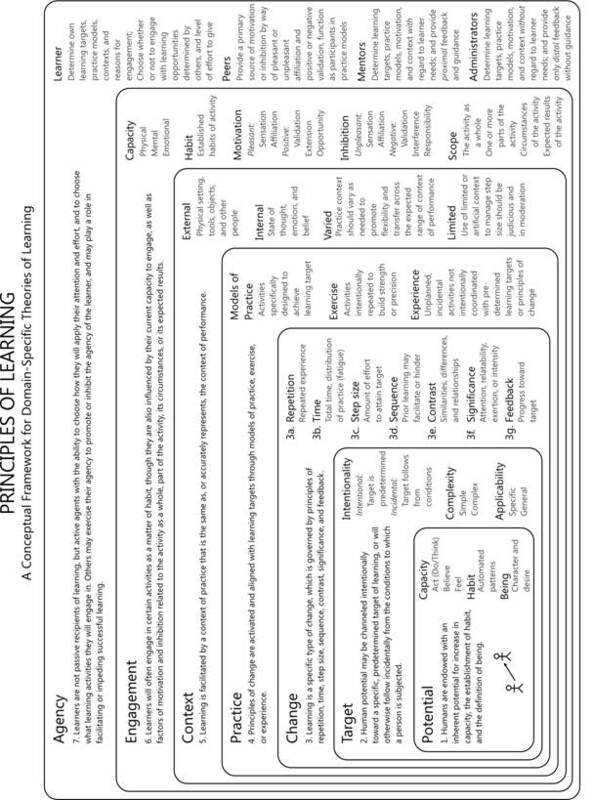 As shown in Table 12, the principles-of-learning framework distinguishes between four agent roles: (a) learner, (b) peer, (c) mentor, and (d) administrator. The learner is assumed to be an active agent, able to determine his or her own learning targets, practice models, contexts of practice, and reasons for engagement. A learner is also able to choose whether or not to engage with learning opportunities that are determined by others, and to decide what level of effort to give. The roles of peer, mentor and administrator are defined with regard to their impact on the learner. The terms mentor and peer are used here in a broad sense, defined by their function in this relationship, as opposed to any concomitant connotation of occupational or enrollment status in a formal institution of education. When a person is co-experiencing learning with the learner and working toward the same or very similar learning goals, they are acting in the role of peer. Peers can be a major determinant of learner engagement by providing motivation in the form of pleasant affiliation and positive validation or inhibition in the form of unpleasant affiliation and negative validation. Peers may also provide examples of emerging or successful models of target performance, and function as observational models to facilitate vicarious learning. Interactive models of practice might also involve peer participation. In some cases, peers will function as human participants in the learning context, without any direct interaction with the learner.